“Just for today, I will have a program. I may not follow it exactly, but I will have it. I will save myself from two pests: hurry and indecision. We, the people of St. Aloysius Parish, are called together by God through our Roman Catholic faith to be an active, visible community where the faith flourishes and grows. As such, we acknowledge God's love, Jesus Christ's redemption, the power of the Holy Spirit, and our individual and collective membership in the body of Christ. It is the privilege, responsibility, and challenge of that membership to manifest God's unconditional love for all His creation. This effort to be Christ-like will be especially evident in our parish worship, evangelization, and service. Here you will find information concerning our parish and its ministries. We hope you find your time spent here a blessing. Our church is a warm and loving church, and we want you to feel comfortable and able to call on us for anything you need. Feel free to browse through the various areas of our website and learn about St. Aloysius! If you are visiting or relocating to our area, we would love to have you be our guest. If you are interested in becoming a member of St. Aloysius, go to the Info Center tab and click on the New Parishioners Registration Form! We will continue to collect funds for the water filters until Easter Sunday. Coin collection boxes can be turned in on Easter. If issuing a check, please make checks payable to St. Aloysius and write "water filters" on the subject line! Extra collection boxes at church doors. St. Aloysius Summer PREP is scheduled for June 17 through June 28, Monday-Friday, from 9:00 a.m. until 12:30 p.m. Registration forms are available by going to the link on our parish website: www.stalshandon.org or you can call Ann Shackleford [738-0808]. NEW FAMILIES: Please register students in the grade the child will attend in the coming 2019-2020 regular school year. Classes will be held in St. Al’s church hall. COUNTRY ARTS BOOTH: Just a note to thank you again for your donations of homemade items for this booth at our Summer Festival! And during this long winter, it’s not too early to begin working on some new homemade crafts for this year’s summer festival! Your donations are welcomed and needed! Travelling and would like to find a Catholic Church for Sunday Masses where ever you may be! Servers, Lectors, Extraordinary Ministers. Please consider; training will be provided. Call the parish office [738-1014]. MAY CROWNING: Thursday, May 2 at the beginning of the; 8:00 a.m. School Mass. All parents, families and friends are invited to attend this service. The 8th grade will crown Mary with the 2nd grade class in attendance. Saturday, May 11, 2019 for the Jog ‘n Jam!! School Visitors: If you need to stop by school to drop off gym clothes, treats or any other items, please come to the office to check in first. Unexpected visits can be disrupting to a classroom. To eliminate this problem, and to ensure the safety of our students, you are required to stop by the office or call ahead so the teacher is made aware of your visit. If you are interested in purchasing a St. Joseph Consolidated School 365 Lotto Ticket, you can contact any St. Joe’s student or the school office [863-8758]. Badin will be off for to celebrate Easter April 18-22. Save the date for the annual Badin Athletic Hall of Fame dinner on Saturday, April 27, 2019, in the Pfirman Family Activity Center. Congratulations to our newest inductees..Rick Kunkel '67, Joe Vogt '72, Fred Hesse '74, Janice Vogt Brown '78, Aimee Hurst Tokarczyk '98 and Nate Bunce '01. In addition, the family of William and Mary Margaret Hogan will be honored as the Legacy Family. Reservations are available after Jan.7 for $35 a person by calling Mrs. Sharon Pate Adams '84 at the high school, (513) 863-3993, ext. 113, or by e-mail at SAdams@Badin HS.org. Children under 12 are admitted for $20. Thanks to HOF chair Dean Wright '65 and the committee for their annual efforts. Queen of Peace Parish is a new subscriber to FORMED. Because St. Al's and QP are in the same Parish region, St. Al's can also use this access. FORMED is Catholic content all in one place. It is a platform of Catholic teachings through videos, audio talks, ebooks, movies, and more. Consider it personal faith formation at your fingertips. As a parishioner you have access to this subscription. You can copy and paste the following website https://formed.org into your URL. The parish code: V3JWJ6. OR...go to the LINKS tab and click on the FORMED.ORG and it will take you directly to the site to subscribe. Please Note: When first signing on to FORMED.ORG, you must register your email address. Who can buy a brick? Anyone can buy a brick for a veteran, past or present; in remembrance of a family member or in a family’s name; your company’s name, an organization, a committee, or your social group. There are many bricks still available! Any donation is tax deductible. 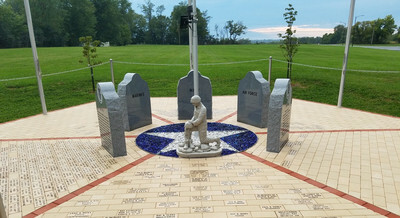 Please make checks payable to: St. Aloysius Veterans’ Memorial. Call Bill [706-5475] if you have questions. We are in the process of updating the parish Guide Book and Directory for 2019/2020. The directory will be coming to your homes mid-year so we can capture any committee election updates that happen in the first half of the year. The Guide Book Committee is asking that you check your household’s information in the directory, and, if it needs to be corrected or updated, please call the parish office [738-1014] or email Nancy Padgett at npadgett_staloysius@fuse.net. Lastly, if you would like to advertise in the Guidebook, please let Sandy know. Thanks for your help. 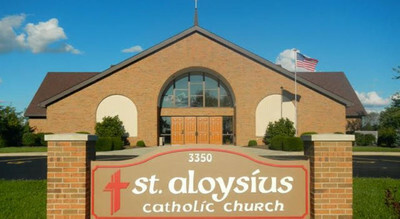 HELPING HANDS: Anyone at St. Aloysius needing temporary assistance in the form of meals or rides to doctors, therapy, treatments, etc., should call Kitty [317-7215], or the parish office [738-1014, ext. 301]. Requests for assistance other than those mentioned above will be considered on an individual basis. We are here to help when help is needed. COMMUNION CALLS: If you are homebound or unable to get to Mass and would like to receive the Holy Eucharist, please call the parish office [738-1014] or Joyce Kist [738- 1368]. Holy Communion can be brought to you at home. ATTENTION PLEASE: If you are a person who receives a LOW GLUTEN HOST, please go to Fr. Jim for Communion and place your hand over your heart as a signal to receive the low gluten host. ROMEOS: The men will meet for lunch this Thursday, April 25, at 11:30 at the Country Barrel. Order at noon! Serve City is an outreach center dedicated to serving the needs of Butler County's low-income and homeless individuals and families. Many churches and other organizations serve dinner to the residents at this center. St. Al's designated day is the 4th Thursday of every month. For April, we are serving dinner on April 25, 2019. If you can donate food or would like to help serve, please contact Sian Stow at 738-4180. INTRODUCTION TO SUPPORTIVE WAYS TO ENTER INTO THE WORLD OF DEMENTIA: St Aloysius Outreach Committee invites you to participate in an interactive three hour workshop that will introduce you to techniques to improve care skills for those assisting loved ones who are living with dementia and those who companion persons with types of cognitive challenges due to brain changes. Common type are Alzheimer’s Disease, Cardiovascular Dementia and Lewy Body Dementia commonly experienced by persons with Parkinson’s Disease. The workshop will include spiritual reflection, didactic material, meaningful conversation, interactive practice of foundational skills in approach to those with signs of dementia and take away handouts plus time for questions and response. Please RSVP as the number of participants in limited. 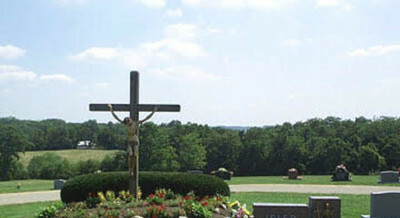 DIVINE MERCY SUNDAY – QUEEN OF PEACE You are all invited to come and celebrate with QP a Divine Mercy Service, next Sunday, April 28, from 2:00 – 4:00 p.m., at Queen of Peace. Come and be a part of this grace-filled event. Please see flyer in Gathering Space. BAPTISMAL PREP CLASS: The next class will be held this Monday evening, May 6, at 7:00 in the Cry Room. Please call Ann Shackleford [738-0808] to register. Parents are encouraged to attend the class prior to the child’s birth. JULIETS LUNCH: Ladies, please note that we will NOT meet for lunch in April. Our next luncheon is scheduled for Friday, May 10, at Cheesecake Please on Colerain Avenue in Groesbeck. The 9th Annual Jog N Jam is scheduled for Saturday 5/11/2019. There are various prizes and incentives that will be offered to students this year. It is very important to look over the registration packet. If you need additional paper copies you can call the office at school or visit http:// stjoesjognjam.weebly.com/ to print more. You can also go to www.registrationspot.com. To guarantee a shirt you need to be registered by April 17, 2019. Making a pilgrimage has power to strengthen and energize your faith and bring sharply into focus the great riches of our Catholic heritage. Join Fr. Geoff Drew, along with hosts John and Cindy Carter, on pilgrimage to the Southern California Missions, including San Diego – which celebrates its 250th anniversary in July – San Luis Rey, San Juan Capistrano and San Gabriel June 4-8, 2019. Call John at 513-582-5551 or Cindy at 513-582-5528, email us at: carter.pilgrim2019@gmail.com, or go to https://www.ctscentral.net/trips/california/southern-missions-cali-fr-geoff-drew for more information. Gentlemen! We will be announcing details about the upcoming 2019 Cincinnati Men's Conference, which is to be held on Saturday, June 15, 2019 at St. Maximilian Kolbe Parish, so mark your calendars. The Retrouvaille Program helps couples restore and rebuild a loving relationship. It is for couples with marriages that are struggling, not communicating well, and those who are considering marriage separation or divorce. For more information contact: www.cincyretrouvaille.org, HelpOurMarriage.com, or call 1-513-456-5413.